Hacienda Amelia was located in Barrio Rio Cañas Abajo, its better known owner was Domingo Palmieri Simonpietri (1830-1907) and his wife Josefina Roubert Castaing who acquired it from José M. Campos. 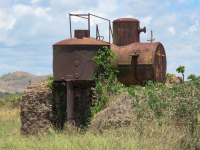 Hacienda Amelia appears to have been in operation already in 1846, by 1906 it had ceased operations and its sugarcane was processed at Central Fortuna . The 1909 Report of the Governor of PR to the President of the United States mentions that a concession of water rights to take water from the Jacaguas River for irrigation purposes was granted to José M. Campos of Hacienda Amelia on October 30, 1846 and a similar right was granted on March 6, 1873 to Domingo Palmieri and Francisco Roubert Castaing (1839-1897). An 1870 Court case established by Juan Cortada, owner of Hacienda Descalabrado regarding the use of water from the Jacaguas River for irrigation, states that the owner of Amelia was the firm Palmieri & Roubert whose members were Domingo Palmieri and Francisco Roubert. At the time, Amelia consisted of 1,378 cuerdas of which 834 cuerdas were from the consolidation with Hacienda Coraza which was already established in 1846. 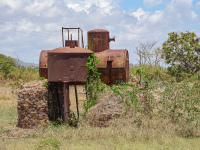 A 1906 court case where the Ponce & Guayama Railroad Co. requests a right of way as a servitude over a tract of land of Hacienda Amelia peoprty of of Domingo Palmieri, states that at the time, Amelia was leased to the Compagnie des Sucreries de Porto Rico . 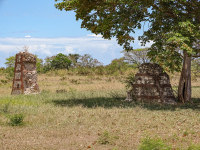 It is widely mentioned that Domingo Palmieri began construction of what has been called a palace on the premises of the hacienda, however, construction was never finished and there appears to be no remains. It is reported that in 1882 Francisco Roubert Castaing and his wife Estelvina Costa Guevara (1853-1900) built a residence on the northwest corner of the Plaza Muñoz Rivera in Ponce, structure that today houses the Ponce Plaza Hotel & Casino . Construction of this residence is also credited to Felix Saurí Vivas owner of Central Constancia in Ponce; the property is sometimes referred to as the Casa Saurí and sometimes as Casa Saurí-Roubert.